I didn’t want to leave. During this visit, I went out on an ROV deployment, toured their then-new drool-inducing Western Flyer SWATH research vessel, and got some great insights into harsh-environment packaging. As a technomad for the past 15 years, I became known through the 80’s for my 17,000-mile adventure aboard BEHEMOTH. In its final incarnation, this computer-laden recumbent bicycle carried 105 gears, satellite net connection, multi-mode ham station, navigation tools, heads-up display, handlebar keyboard, pneumatic landing gear, and much more. The bike is retired now except for accompanying me on occasional speaking tours, while the new project—the Microship—is underway in my Camano Island lab. This canoe-scale pedal/solar/sail microtrimaran includes a graphic browser-based interface to embedded control and data collection systems, along with wireless links to manpacks, and a fully integrated suite of navigation and weather tools. 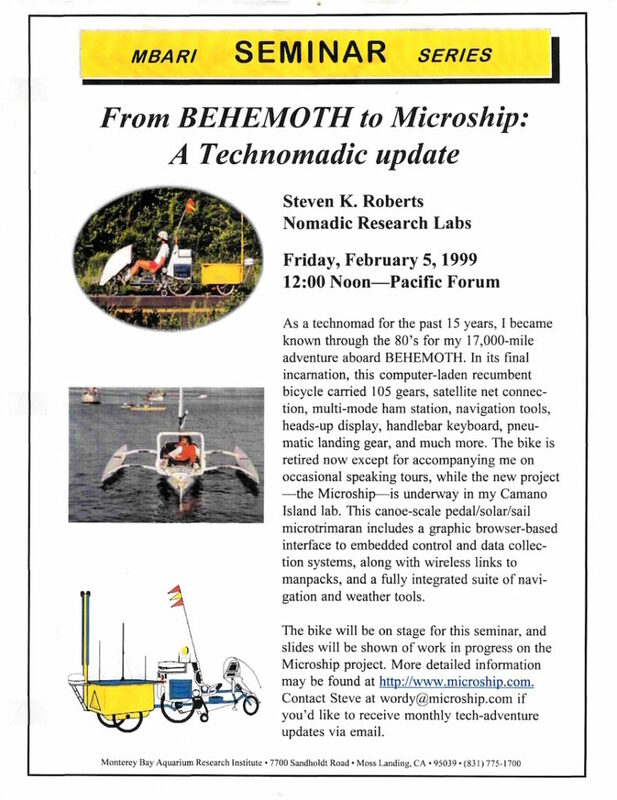 The bike will be on stage for this seminar, and slides will be shown of work in progress on the Microship project.